Did you know that five million people visit the Grand Canyon every year but only 10% of those visitors come to the North Rim? Many may assume that if you have seen one rim of the Grand Canyon, you have seen them all. Wrong! 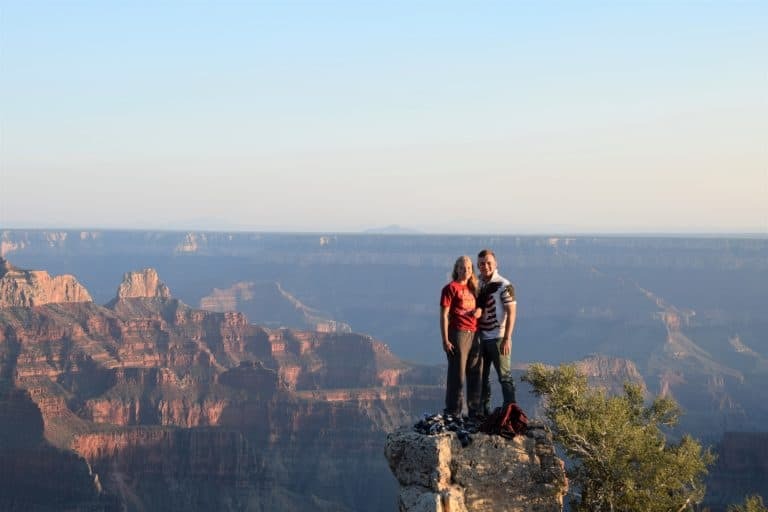 There are many great things to do in the Grand Canyon North Rim. The views and ambiance are much different on this side of the canyon. 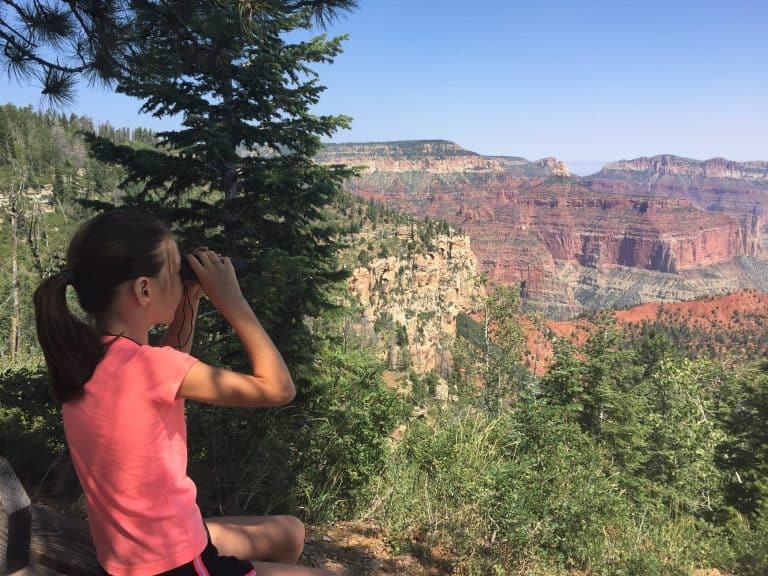 Here is your guide to visiting the Grand Canyon North Rim with kids, including Grand Canyon North Rim activities, dining suggestions, lodging information, and plenty of tips for an awesome trip. Headed to the South Rim? Check out our full guide on the Grand Canyon South Rim with kids. Unlike the South Rim, the Grand Canyon North Rim is only open seasonally. The Grand Canyon North Rim sits at 8,000 feet and closes due to snow. All North Rim roads are closed from December 1 through May 15. The full-service season when lodging, the Visitor Center, restaurants, and other services are open, is May 15 through October 15 each year. Due to its higher elevation, temperatures are generally cooler on the North Rim than the South Rim. Daytime temperatures in the shoulder season months of May, September, and October average in the 60s and dip down into the 30s at night. During the summer, highs are generally in the 70s and lows are in the 40s. Afternoon thunderstorms are common in the summer months. The closest major city with a large airport to the Grand Canyon North Rim is Las Vegas. Many people rent cars or RVs in Las Vegas and drive to the Grand Canyon North Rim. The trip is about 5 hours in length. Zion National Park and Lake Powell are great destinations to add to your Grand Canyon North Rim road trip since they are close to your route, relatively speaking. Read all about the epic fun to be had on a houseboat trip on Lake Powell. Then check out our guide to Zion National Park. Note: Although the North Rim is just 10 miles across the canyon from the South Rim, the drive from the South Rim Village to the North Rim Village is 4.5 hours. Why? Because there is a giant canyon in the way, of course! There is a rim to rim shuttle service offered (popular with hikers). It departs twice daily. Reservations are required at least 48 hours in advance and the fare is $90 per person one way. The atmosphere at the Grand Canyon North Rim is much different than the South Rim. 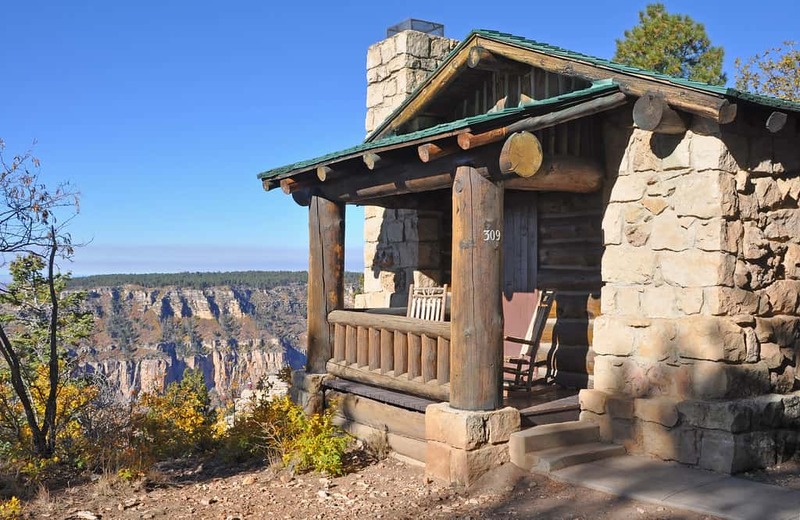 While the South Rim has a definite, high desert feel, the North Rim is nestled in the forest. 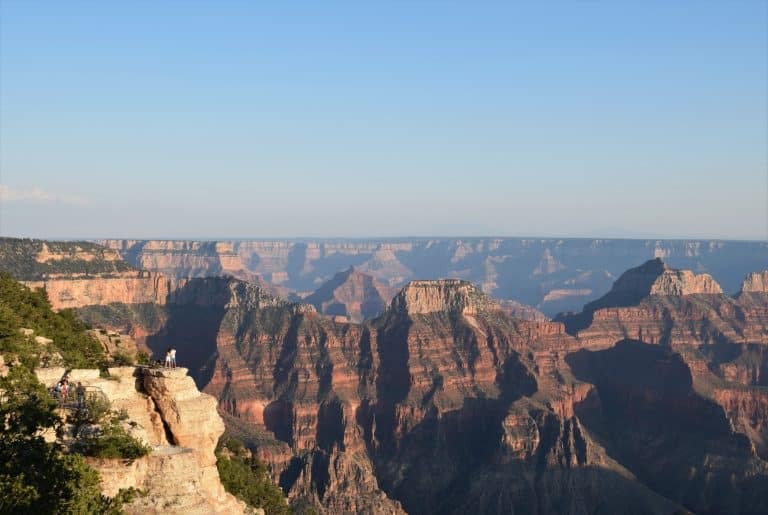 When you cross into Grand Canyon National Park from the North Rim, you will still have a 13-mile drive before you reach the North Rim. Keep your eyes out for a park’s herd of bison which is often seen grazing not far from the road. The hub of activity at the Grand Canyon North Rim centers around the complex that houses the visitor center and Grand Canyon Lodge. Good to know: There is a $35 fee per car to enter Grand Canyon National Park. This gives you access to the park for 7 days. Your first stop in any national park should be the visitor center. This is where you can pick up park brochures, speak with rangers, look at exhibits, and pick up your child’s Junior Ranger booklet. 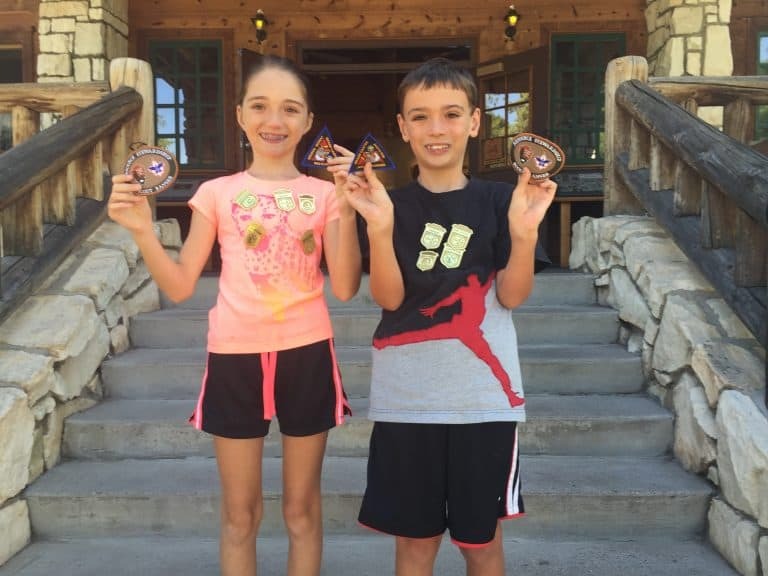 Be sure to have your kids complete the booklet even if they have already received a badge on the South Rim because the badge on the North Rim is different. If you think that the views at the North Rim are going to be similar to those on the South Rim, think again! 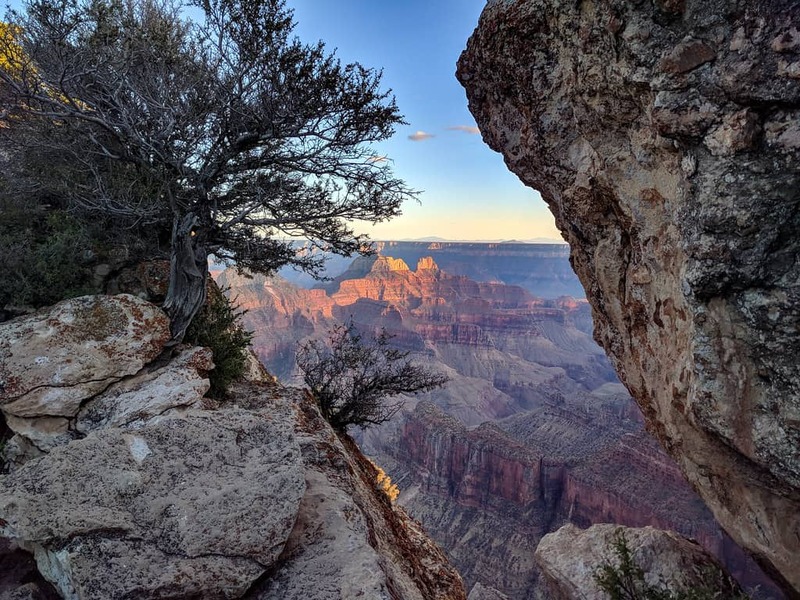 At the South Rim, you feel like you are at the same level as the upper portion of the canyon, and can simply look out and be surrounded by it all. 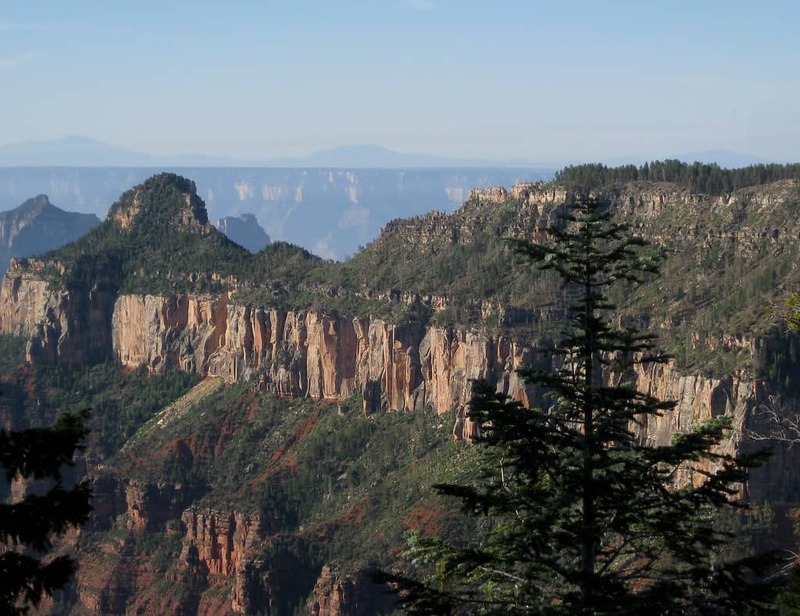 At the North Rim, you feel like you are at the top of the world and the views are below you. I found that my fear of heights was much more pronounced at the North Rim. There were far fewer walls separating visitors from the canyon’s edge and everything just wilder and less developed. Watching people get dangerously close to the edge in order to get a good shot for Instagram was nerve-wracking. Definitely keep an eye on your children and a hand on them if they are young. 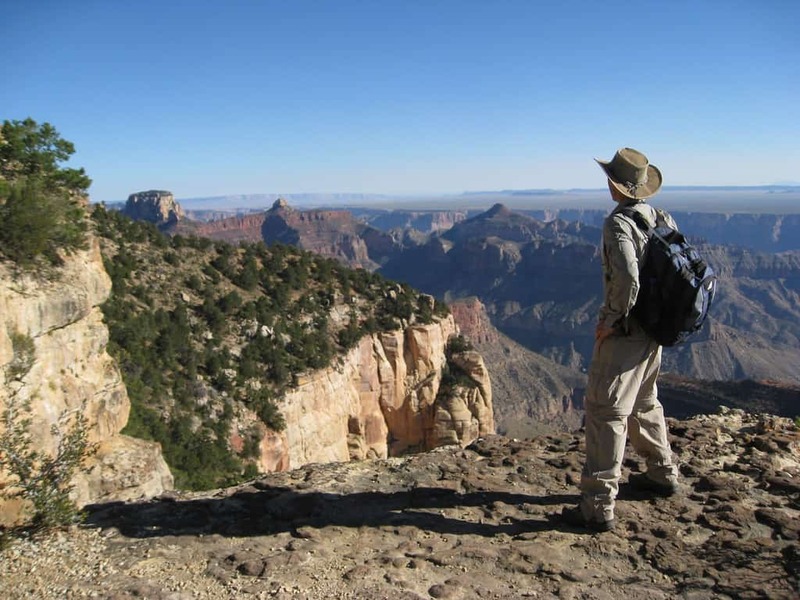 There are many more hikes to enjoy on the North Rim than the South Rim. Here are a few good options for families. This is easily the most popular trail on the Grand Canyon North Rim. It begins at the Grand Canyon Lodge and is only 0.7 miles in length round trip. There are railings in a few places but most of the trail does not have a safety rail separating you from the edge. There are drop offs on either side of the trail but the trail is wide and as long as you stay on the trail, there is nothing to worry about. Be sure to hold hands with young children and keep them away from the edge. This is one of the most popular viewpoints, and trust me, the views are breathtaking. 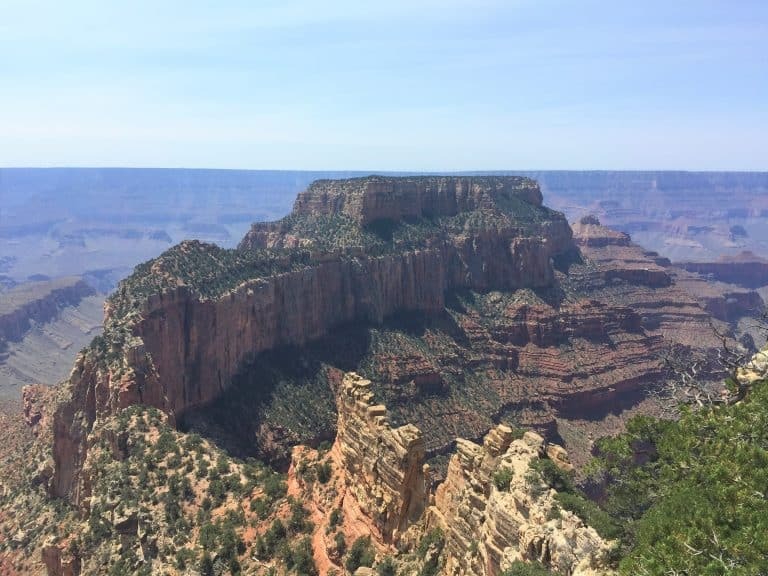 The Transept Trail is mainly used as a way to go from the North Rim Campground to the Grand Canyon Lodge. It is quiet and well-shaded, making it a pleasant walk. It is about 1.5 miles in length, one way. The views of the canyon are nice, especially around sunset. This short, half-mile trail is more of a walk from the parking lot. You can see all the way down to the Colorado River from the viewpoint. You can also see a really neat arch-like formation called Angels Window. Don’t miss the short spur trail which leads to you to a spot where you can actually stand atop Angels Window. This is a 4-mile trail (roundtrip) to a view of the Grand Canyon. This trail is nice because it makes it way through the shaded forest for a portion of the hike, and there are not as many people at the viewpoint since it is further from the road. The trail is kid-friendly until you reach the canyon edge. Then exercise the same caution around the edge as you would anyplace else on the North Rim. You can get some really cool “sitting on the edge of a cliff” pictures here but please, be careful!!!!!! Note: The North Kaibab Trail is the only trail which takes hikers down to the bottom of the Grand Canyon from the North Rim. This trail is very steep and it is 14 miles from the trailhead at the top of the North Rim to the Bright Angel Campground at the bottom. It should only be attempted by very experienced hikers and is not suitable for young children. 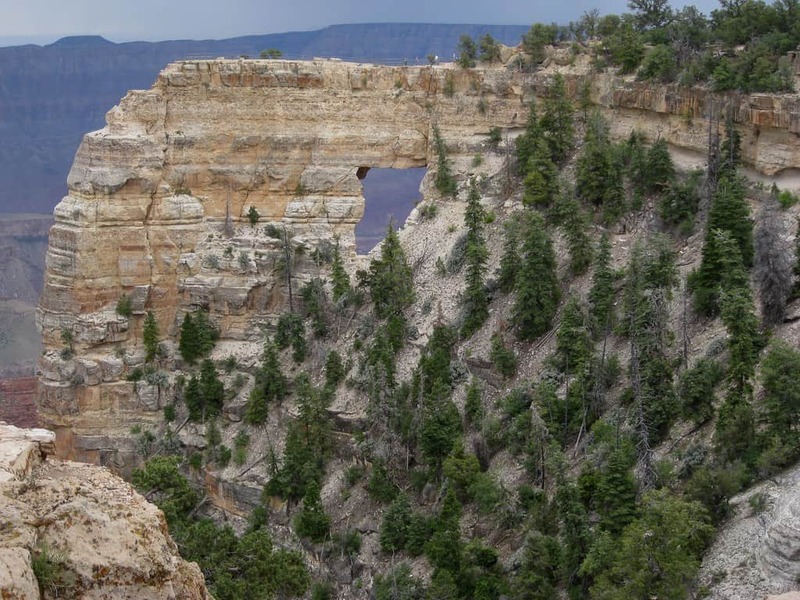 The scenic drive at the Grand Canyon North Rim is filled with viewpoints to stop and enjoy. Some of these viewpoints include short hikes like Cape Royal and Point Imperial. Others are merely pull outs on the side of the road. Expect the 23-mile drive to take a half day to complete with stops. Check for amazing deals on family-friendly hotels near the Grand Canyon North Rim. Teddy Roosevelt once saw the Grand Canyon by mule so why shouldn’t you? 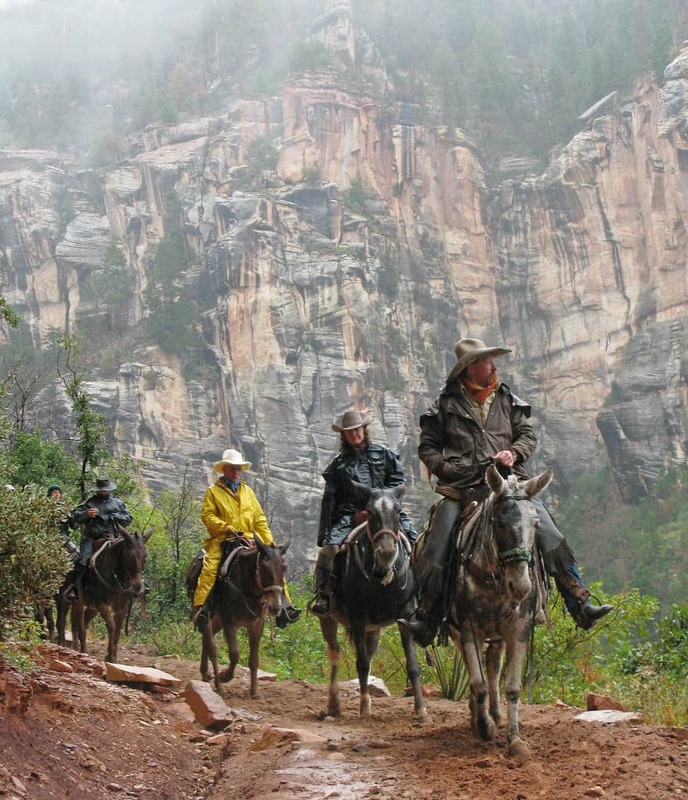 While there are no mule rides from the North Rim which take you to the bottom of the Grand Canyon, there are still some great options for families. If you have kids that are at least 7 years old, the 1-hour Grand Canyon Rim ride is a nice, affordable option. The price is just $45 per person. The weight limit on this trip is 220lbs. If you have children that are at least 10 years old and are looking for something more involved, there are two 3-hour tours to choose from. The first trip goes through the forest out to Uncle Jim’s Point where canyon views abound. The weight limit is 220lbs. The second trip descends 2300 hundred feet into the canyon via the North Kaibab trail until it reaches Supai Tunnel. The weight limit is 200lbs. It is $90 per person for each of these tours. All these mule rides can either be booked online or at the Grand Canyon Trail Rides desk in the lobby of the Grand Canyon Lodge. There is a shuttle bus from the lodge to the trailhead which leaves a half hour before trip departure. Exploring more of the state? Check out the Top 10 Things to do in Arizona. The Grand Canyon Lodge is the main hub of activity at the Grand Canyon North Rim. It is the place to eat, stay, and book activities, but it is also a destination unto itself. 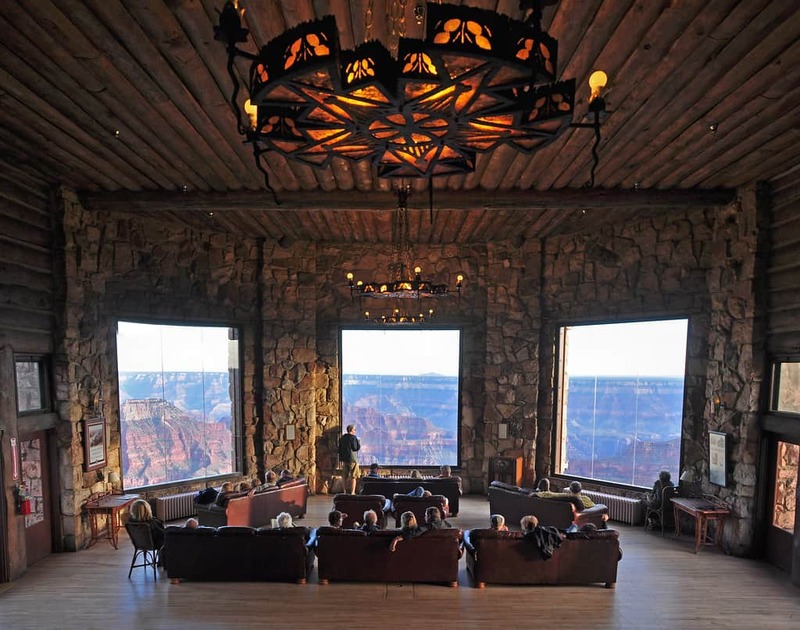 There is an awful lot of “wow” packed into the lobby and veranda of the Grand Canyon Lodge. The building was constructed using native timber and stone in 1928. It is literally built on the edge of the Grand Canyon, and the views are incredible! The back veranda of the Grand Canyon Lodge has some of the best views you will ever experience, making it the perfect place to enjoy a cocktail and the sunset after a long day of exploring. Keep your eyes out for California condors soaring above. This is also a common place for Ranger Programs to take place, so check with the Visitor Center for a current schedule of happenings. If you are looking for lodging inside Grand Canyon National Park at the North Rim, the Grand Canyon Lodge is the only place you will find it. The next closest lodging is at Kaibab Lodge (18 miles north) or Jacob Lake Inn (45 miles north). Lodging reservations typically open in mid-April for the next year (example: Summer 2020 lodging opens in April 2019) and can book up rather early. 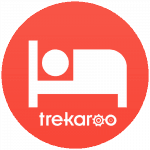 Check for last minute cancellations and you may get lucky- we did! There are a few different types of lodging options at the Grand Canyon Lodge. Most of them are cabins, but there is a motel as well. Western cabins sleep 4 people and are equipped with 2 queen-sized beds, a bathroom, and a front porch. Pioneer cabins have 2 bedrooms and sleep 6 people. One bedroom has a queen bed. The other bedroom has a bunk bed and a full-size sleeper futon. There are a mini fridge and coffee pot inside these cabins. The bathroom has a shower only. Frontier cabins sleep up to 3 people. There is 1 double bed and 1 single bed. The bathroom has a shower only. Motel rooms have 1 queen bed and can sleep up 3 people with the addition of a rollaway bed (which must be requested). These rooms do have a mini fridge and a bathroom. 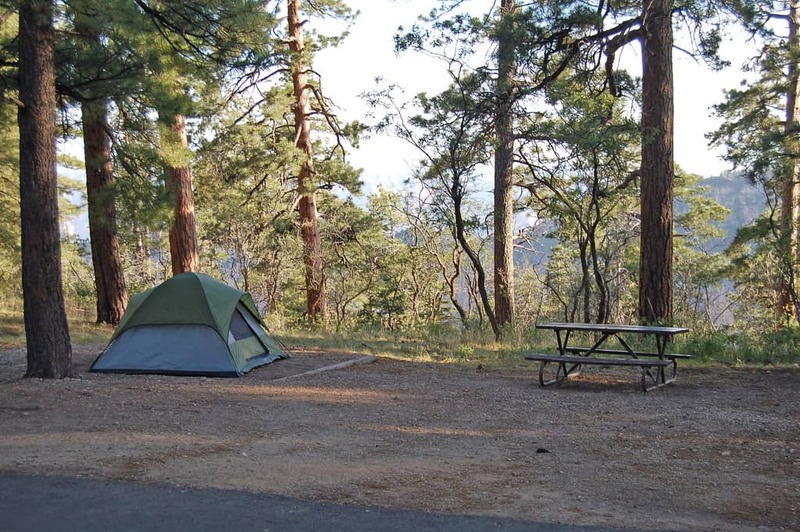 The North Rim Campground has 90 campsites nestled among the aspens and Ponderosa pines at 8,200 feet. Sites come with picnic tables and campfire rings with cooking grills. There is drinking water as well as coin-operated showers and laundry available. There are no hookups but there are some RV sites. 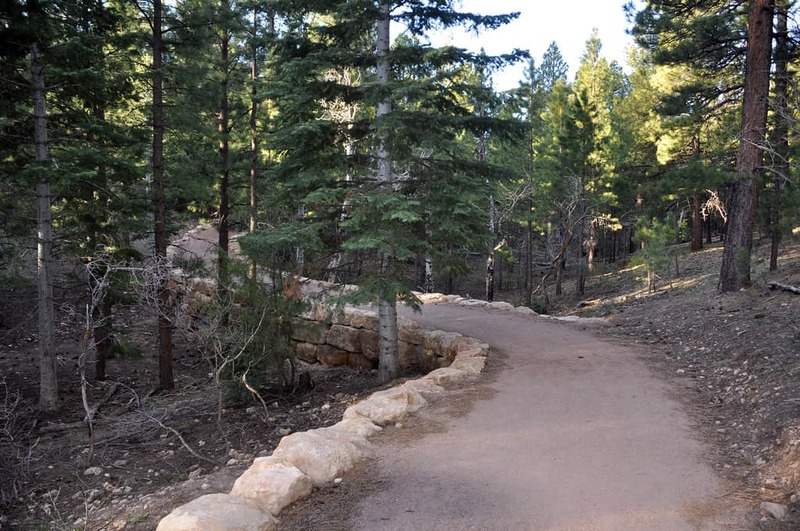 The Transept Trail connects the campground with all the facilities at Grand Canyon Lodge. The campground is open mid-May through mid-October and sites can be reserved 6 months in advance. A few sites have great views of the Grand Canyon. As you can imagine, these go quick. 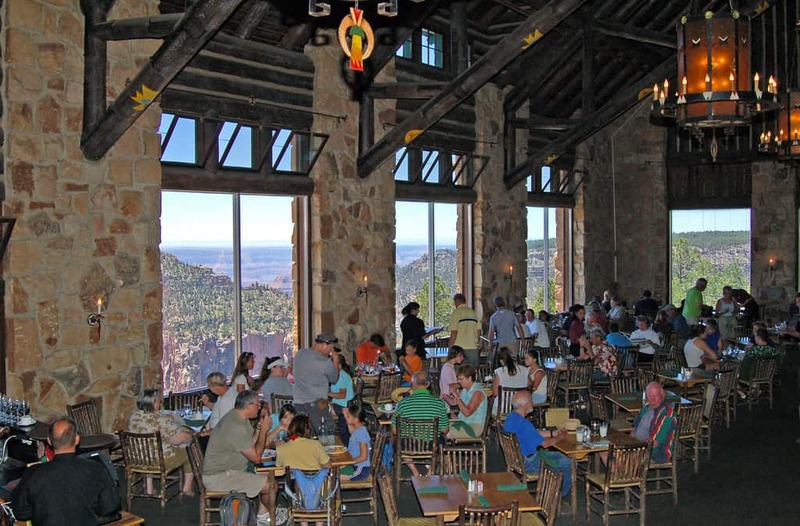 Three meals are served daily in the gorgeous Grand Canyon Lodge Dining Room. Breakfast eaters have the option of a buffet with hot and cold breakfast items or ordering from a traditional menu. Breakfast burritos, pancakes, yogurt parfaits, and huevos rancheros all grace the menu. There is a nice variety for kids as well, from pancakes to cereal to an egg white scramble. One of the more fun options for lunch is the soup, salad, and sandwich bar buffet. The cost is about $17 for adults and $10 for kids. This all-you-can-eat option might be just the right thing after a morning of hiking. Entree salads, sandwiches, Navajo tacos, burgers, and more are available on the traditional menu. They are priced in the $10-$15 range. Children will find a kids menu with quesadillas, burgers, grilled cheese, and more. Adult dinner entrees range in price from about $15-$30. Highlights include Point Imperial Bass, Venison Meatloaf, and Angels Gate Smoked Baby Back Ribs. Kids dinners are about $7-$10 and include a beverage. There is a nice range of options from chicken tenders to grilled shrimp. If you are looking for a quick coffee and a breakfast burrito in the morning, head to the coffee shop. They serve a variety of espresso drinks as well as regular drip coffee. They also have various breakfast breads, muffins, scones, and cinnamon rolls on hand for purchase. Deli in the Pines is a great place to grab salads and sandwiches to take on your day’s explorations. They also have several snacks and drinks to choose from. If your kids are exhausted from a day of hiking, stopping at the deli and bringing something back to your cabin is a nice option to have. The deli is open from 10:30am until 9pm. The Roughrider Saloon opens up around lunch time and has a great list of local brews on draft as well as some fun specialty cocktails. I can recommend the Kaibab Coffee Stout, Bright Angel IPA, and the Prickly Pear Margarita. I love that you can order these drinks in the saloon and then take them out onto the Grand Canyon Lodge veranda to enjoy those magical views. There is waiter service on the Veranda which allows you to order drinks and some limited menu items. Choose from options like a cheeseburger, wings, a quesadilla, or a beef brisket sandwich with fries. The drink menu is basically the same as the Roughrider Saloon.